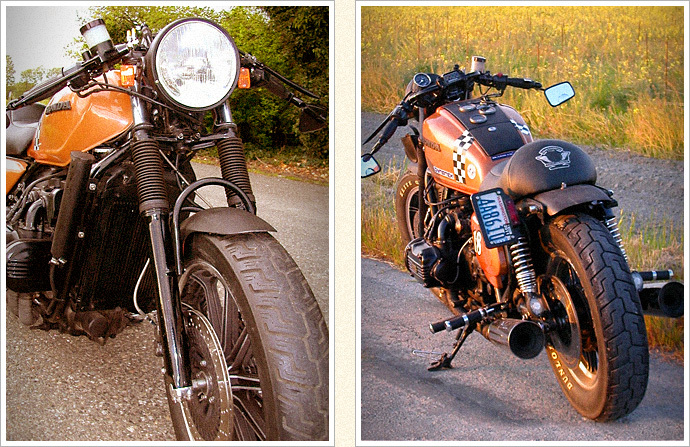 “I live and work on Bradshaw Road near LaConner, WA; my builds are badged under the name Bradshaw Bikes. 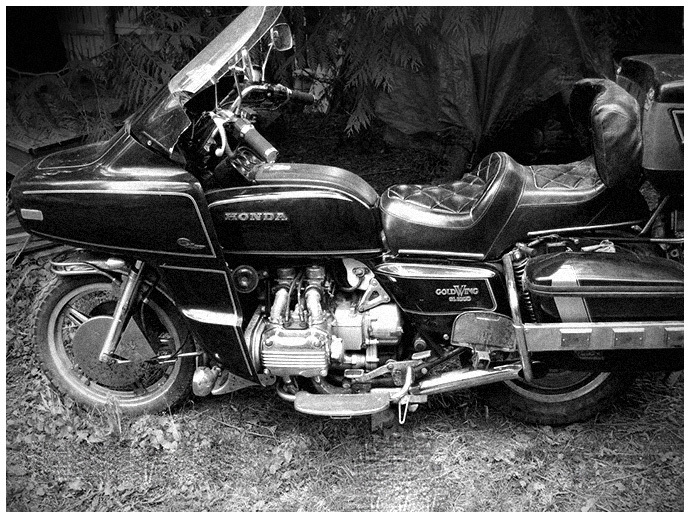 While working on builds, Bradshaw also produces custom Vyper clutch and brake levers, and provides polishing services to the older Goldwing community. “Building replica handlebars with broomsticks and duct tape made the Clubmans an obvious choice. Not too low, not too high, the right angle to allow wind to lift some pressure off my arms at speed. Progressive springs and an old-school fork brace were added up front. I added gaiters just ‘cause they looked cool with the fork brace. 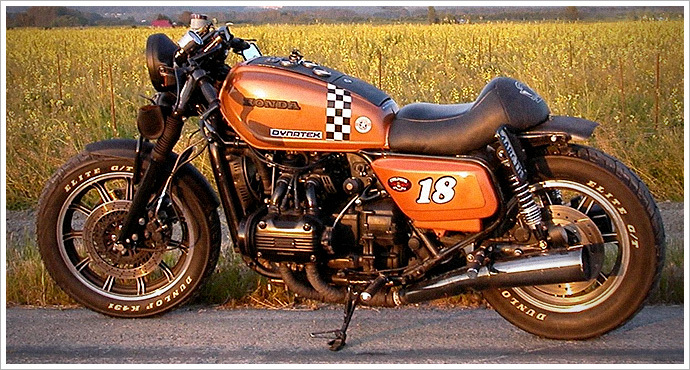 The front fender is from an 83 magna, and the rear is a trimmed off trailer fender purchased from a trailer supply company. I tracked down some old GM bronze block paint, shot the body, laid in the checker board and graphics, and hit it with about four coats of clear. The number is a tribute to my father, who used to race stock cars in the early fifties under the “18” plate. A seat pan was cut from the old seat. It was sculpted with new foam, and a carbon fiber style cover was upholstered. Lighting for the rear end was converted to LED. A small LED was mounted on the tail end of the frame to light the tag. The dual piston calipers were modified off of an 82 GL. The vented rotors were taken off an 84, drilled and mounted. Stainless lines replaced old spongy OEM brake lines. Braking became two fingered. A cast Lester rear rim was polished and added to complement the front 83GL cast rim. The OEM mechanical systems were replaced with an electronic ignition and fuel pump. The stock coolant tank was removed and a custom tanked strapped to the front frame down tube. 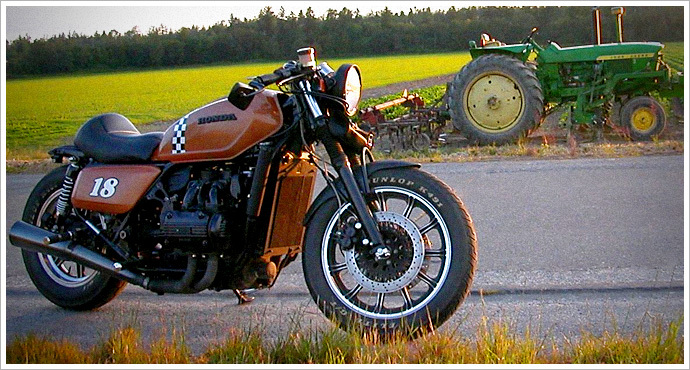 I strived to keep the build clean, shunning typical Goldwing adornment. Everything had to have a purpose, a necessity, to be on the bike. For the cockpit, I removed all the large OEM gauges. 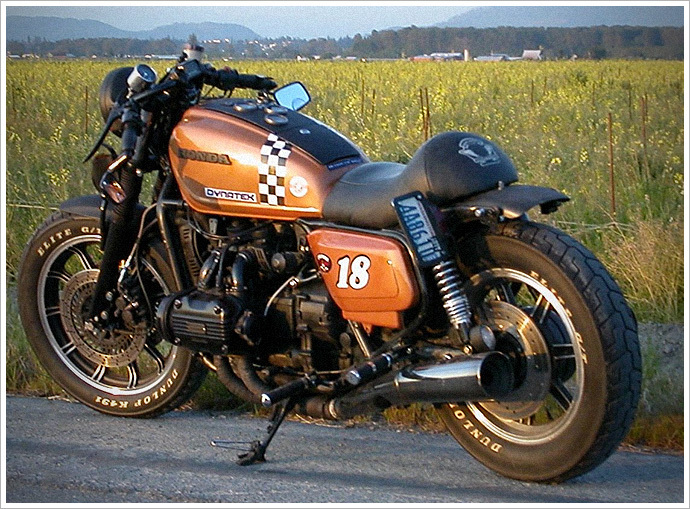 A mini speedo for a CB750 was fitted, and the instrument lights were swapped to a 74 Honda 450 handlebar clamp cluster. The stock gauges were moved and recessed into the shelter lid. Wanting big light, I added a Marchel headlight from an old Alpha Romeo. The thing sets roadside vegetation on fire. A Stebel air horn fit perfectly under the frame near the engine. Napoleon Mirrors were hung on the bars. The exhaust headers were wrapped and joined to an exhaust system from a VF1000. Richard tells us that he’s currently building a supercharged cafe/sportsbike and an “evil” bobber in his shop for some very lucky customers. If they manage to come up to scratch in the same way this little Goldie has, no doubt he’ll be sitting pretty on a backlog of build requests for a good few years. As always, the moment he finishes them, you’ll see ’em here.